Having relocated from California, the client wanted to create an oasis in Ohio that reminded her of home. 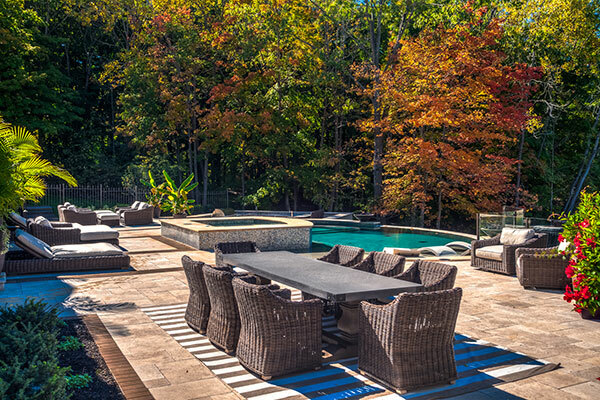 This meant creating a large outdoor living space that included a pool, spa, outdoor kitchen, fire pit, and a variety of seating and dining areas. The client also wanted a formal front auto court, enhanced driveway and improved pedestrian circulation around the property. 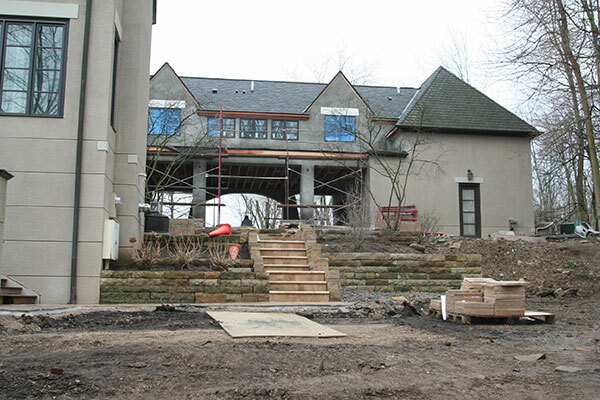 The project’s biggest challenge was designing and constructing on a 20-ft. slope down to an existing pond, seen here in a view from the patio. Addressing the extreme grade change required extensive planning and coordination among designers, engineers and other professionals on-site, as the house was also going through an extensive interior renovation and addition. 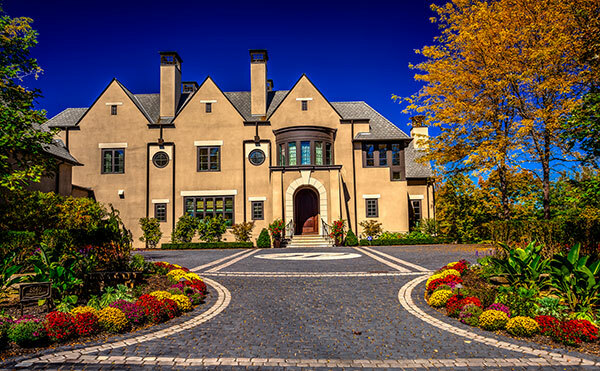 This project earned Hidden Creek Landscaping a Grand Award last year from the National Association of Landscape Professionals’ Awards of Excellence program. A before shot of existing house and landscape. 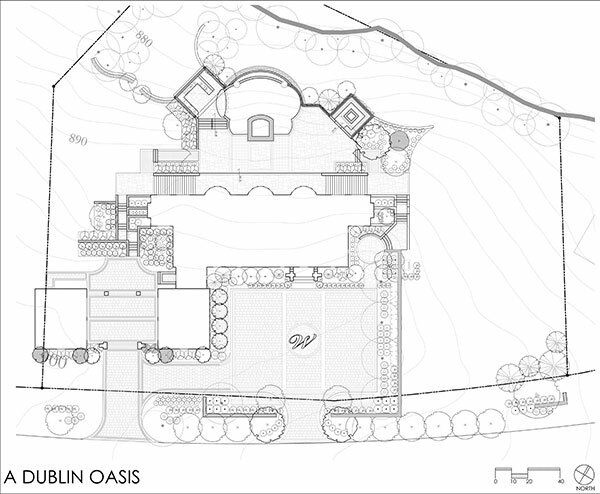 The sheer size of the project was difficult, for no portion of the property went untouched. Before shot of backyard with 20-ft. slope. 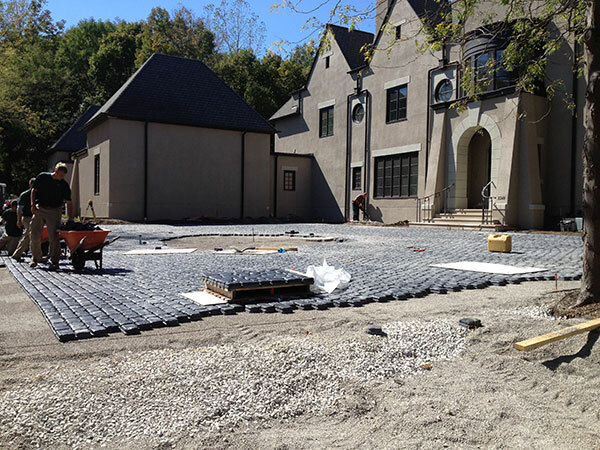 The cobblestone auto court and driveway consisted of 6,600 sq. ft. of paving material and 115 tons of gravel. 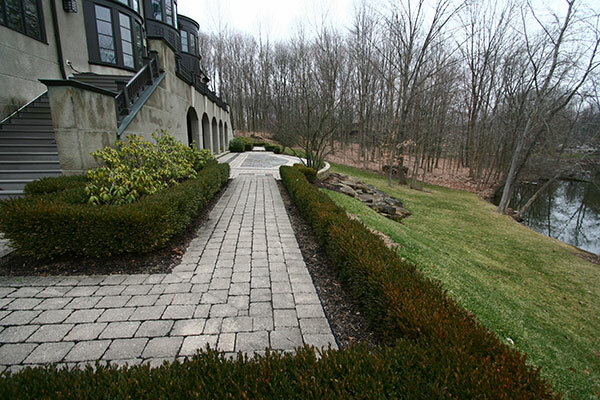 The placement of plant material supports the property’s stately appearance, while providing areas for annual color. 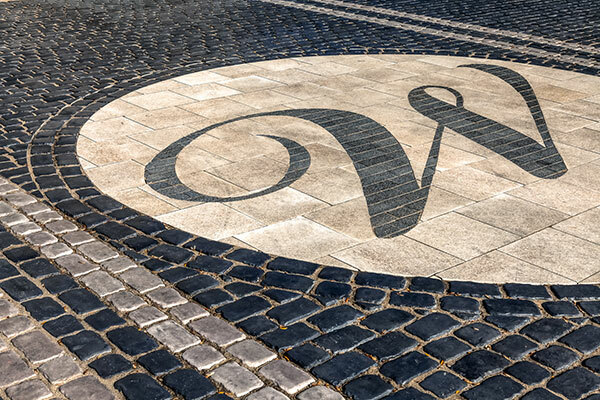 The script “W” in the custom entry area took 20 man-hours to cut into the circle. 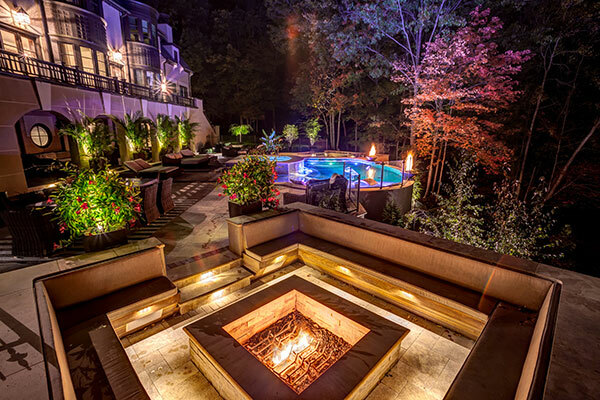 As seen lit at night, the rear pool deck and patio consists of 4,000 sq. ft. of travertine and 700-plus sq. ft. of custom travertine coping. The terrazzo patio, along with the pool, sits approximately 20 ft. above grade, requiring 500 tons of gravel backfill. Seating areas are defined by paving and landscape. 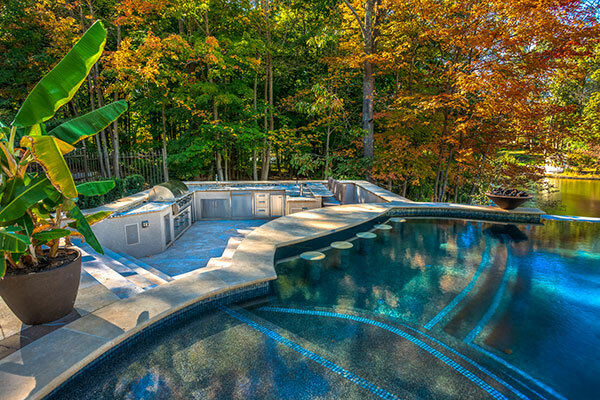 The sunken kitchen features a swim-up bar. During construction, the client decided to attach the existing two garages with a second-story nanny suite. 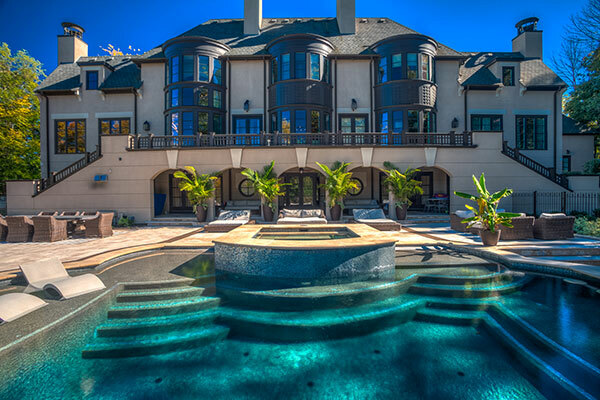 This entailed multiple modifications to Hidden Creek’s original design. 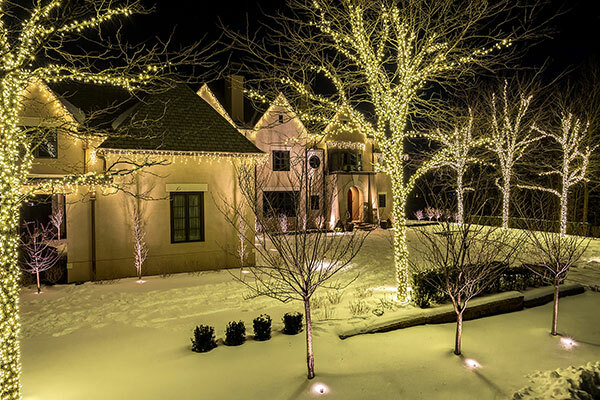 One thing Ohio has over California: Winter snow to showcase holiday lights. The hardscape choices, tropical plants and seamless flow among the various zones recalls the California way of outdoor living, as seen in this night view.